Venice was now completely isolated in an Austrian sea. The news of Custozza and the armistice ‘fell on Venice like a thunderbolt from a serene sky’, as the American consul, Edmund Flagg, put it. The Venetian vote for ‘fusion’ was now redundant, and Daniele Manin emerged from the crisis with great credit. The small, bespectacled republican had refused to be part of the monarchist provisional government that had been appointed on 5 July: ‘I am and will remain a republican. In a monarchist state I can be nothing.’ As if to ram the point home, Manin put on his civic guard uniform and, with the rank of private, took his turns doing sentry duty – a simple citizen doing his best for his city. 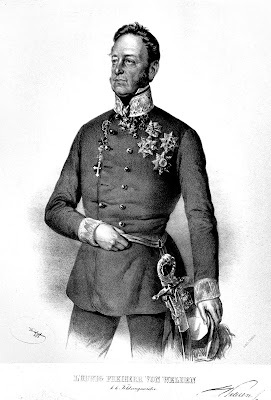 The monarchist ‘July government’ certainly had its work cut out, for the Austrians, commanded by Marshal Franz von Welden, had isolated the city from the terra firma. His forces, numbering some nine thousand, were now extended in a cordon around the lagoon. Yet many of these troops were shivering with malaria, and there was no immediately obvious way of striking at the city itself, which was defended by no fewer than fifty-four forts, only three of which were on terra firma. Command of the 22,000-strong Venetian forces (of whom 12,000 were Italian volunteers and regular troops who had converged on the city from all over Italy) had been given on 15 June to General Pepe, who had reached the city on a steamer from Chiogga with the remnants of his Neapolitan regiments. The population’s hostility towards the monarchists was palpable: the provinces of the mainland had voted for fusion, not the great city itself. With news of Custozza, the anger in Venice boiled over. On 3 August, some 150 people, fired up with Mazzinian ideas, gathered in the Casino dei Cento and established the Italian Club, ostensibly to discuss the problems of the day, but in reality as an alternative, republican, centre of power. When the Piedmontese commissioners, who had been sent to Venice to assume authority in Charles Albert’s name, arrived four days later, they were greeted with a storm of hostility. On 10 August, the leading republicans, including Manin and Tommaseo, signed a protest and demanded a meeting of the Venetian assembly. The government made itself remarkably unpopular when it tactlessly cited the old Austrian laws to try to silence its critics in the press and in the Italian Club. The following day, it yielded, agreeing to the creation of a committee of defence to be elected by the assembly. The Piedmontese commissioners resigned their powers, but they were still hounded on Saint Mark’s Square, by a Venetian crowd baying for their blood. At this dangerous moment, Daniele Manin was busy browsing in a bookshop. This pleasant activity was interrupted when he was summoned to meet with the government and the commissioners. His very appearance on the balcony above the Piazza stilled the turbulence below. Manin promised them that the Venetian assembly would meet on 13 August and that, in the meantime, he would assume power. He called on all Venetians to defend their city. His audience, which moments before had been intent on murder, erupted into ecstatic cheering: ‘Viva Manin! To the forts!’ The mood of the city changed from one of anger and bewilderment to one of hope: the son of a leading republican later recalled ‘with what confidence in saving the motherland we stayed up to watch the dawn breaking over the railway bridge and the battered vessels of our fleet!’ Manin had carried off a coup, and not just against the monarchists: he had also stolen a march on the Mazzinians, who had hoped to seize power themselves. Manin had always feared the dangers of mob rule. To him, Mazzini’s ideas of revolution seemed to pose just such a threat, and one of his tasks, as he saw it, was to prevent ‘anarchy’. He viewed the June days in Paris as precisely the kind of bloody social chaos into which Venice could easily sink unless its leaders made law and order their priority. Nevertheless, the more urgent problem was the war against Austria, which Venice was now bearing virtually alone. When the assembly met on 13 August, Manin agreed to share power with two military commanders, one from the army, Colonel Giovanni Cavedalis, the other from the navy, Admiral Leone Graziani. In order to ensure that the greatest possible unity would prevail, Manin went so far as to declare that Venice would not, once again, be proclaimed a republic. The government, he said, was provisional ‘in every meaning of the term’. This was another slap in Mazzinian faces, who were capable of mounting a serious challenge to the new triumvirate, since they had a great deal of support among the non- Venetian volunteers and troops. But Manin’s popularity with the wider population was greater still, and he had the backing of the commander-in-chief, Pepe. So it was that, until the autumn, Manin successfully resisted the pressure from the Italian Club (and from Mazzini himself ) to transform Venice into the hard kernel of Italian republicanism, from which the rest of the country could be revolutionised.